"Will Ousmane Dembele be a success at Barça?" remains the million dollar question. His crucial impact in certain matches this season make you believe he will. In fact, if you were to only consider his contribution on the pitch you'd be absurd to question the French man. The problem with Ousmane, as Pep Guardiola used to say, is the 'feeling'. From the outside looking in you get the impression the whole dressing room is on one side and Dembele on the other. At Vallecas, for example, no one went to hug the French forward after he made it 2-2. Even when Alba or Suarez wanted to make a point to the player they did so from a distance. We also haven't seen Messi or Pique joking around with him. It's true that professionals don't have to be friends with each other to succeed, but rather work hard and search for the best for the team. 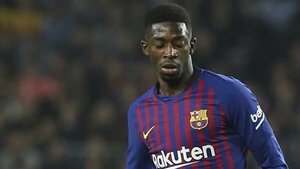 But everything would be much easier if Messi and Luis Suarez opened the door for Dembele. They did this with Neymar who was also quite young at the time. This is why Samuel Umtiti is so important. He too needed time to adapt at the club. But just like you would at university or with your Sunday League squad members, those team dinners allow you to stop being just a player and allow others to get to know the person. The problem with Dembele appears to much further away from the pitch as, on it, he's already shown he can play an important role.